A test mule for mixed-surface use (gravel). 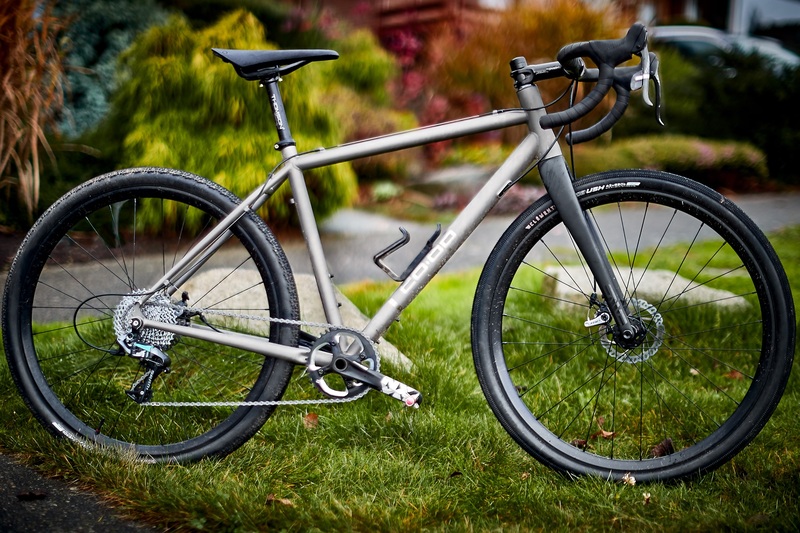 This is a test mule for all the new options in mixed-surface bikes. Manufactures are responding to demand with lots of new product. 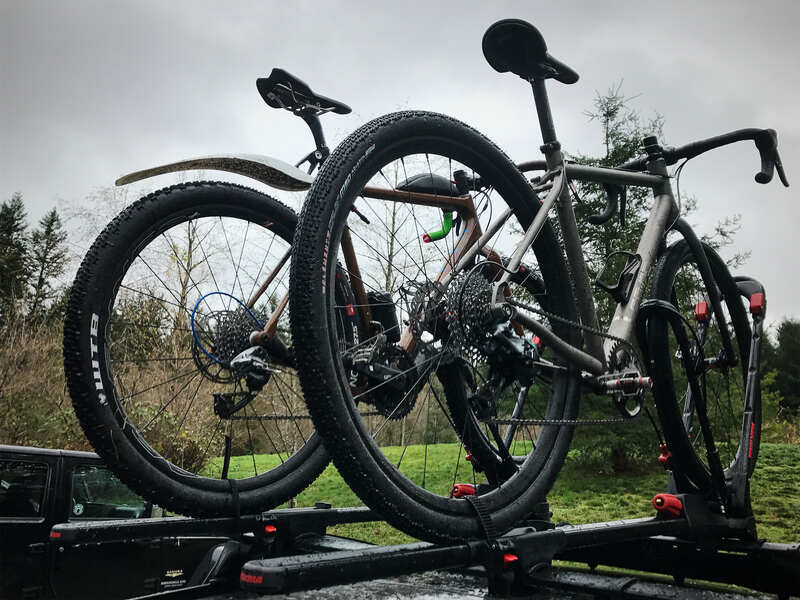 This CO-OP‘s purpose is to hang different parts on it to find the best combination before REI goes to market with their take on gravel sometime maybe next year. 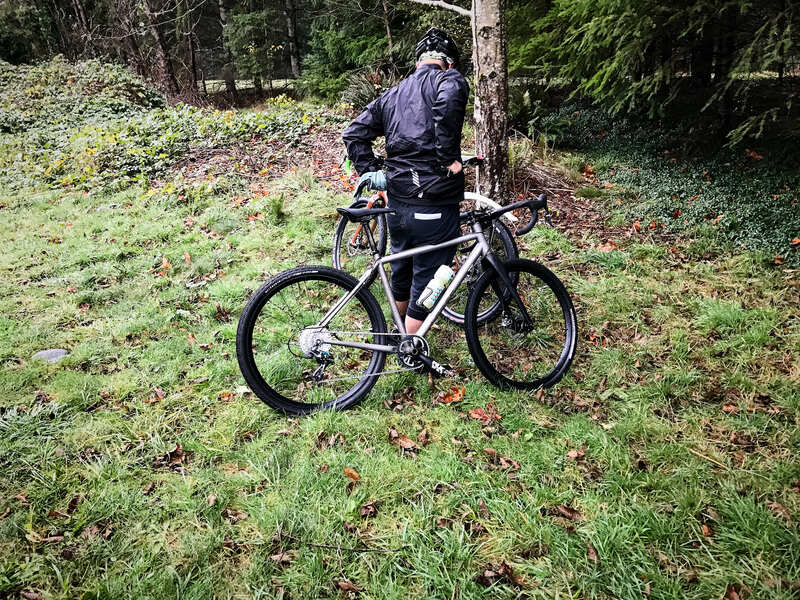 What’s interesting about the Ti test mule (the bike doesn’t have a name, it’s a factory sample) is the street-sweeper low BB and long wheelbase. In person, the test mule looks like a longbed pickup truck compared to a 3T Exploro rally car or stripped-down Range Rover style of the U.P. All three fit 700c and 650b wheelsets with a max tire size of 2.1s in MTB sizing or 42s in road. Steve insists I was pushing the pace, I’m sure HE was. The rest of the ride, besides half-wheeling each other and discussing how well our kit was working against the elements, we discussed gearing and 1x v. 2. We rode through a Santa-hat photo shoot on a trestle too. “1x”, is a single chainring rather than two (or in years past, three chainrings), is a gravel category differentiator from road and one of the ways manufacturers manage to stuff a huge tire into a frame with traditional road geometry….by reducing the front chainring diameter to a max of 50 teeth or by removing it and the front derailer entirely. 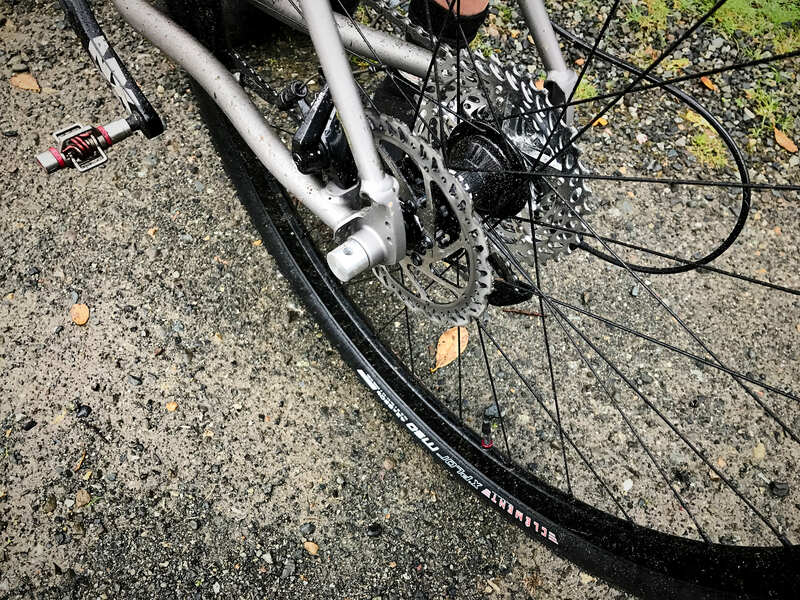 A 1x crankset (or “sub-compact” or “cross” crank no bigger than 50 teeth) frees up space for a large-volume tire without increasing Q-factor (the distance between pedals). You’ll not see this particular iteration of the test mule in production or at a store near you, so I won’t go into much more detail. 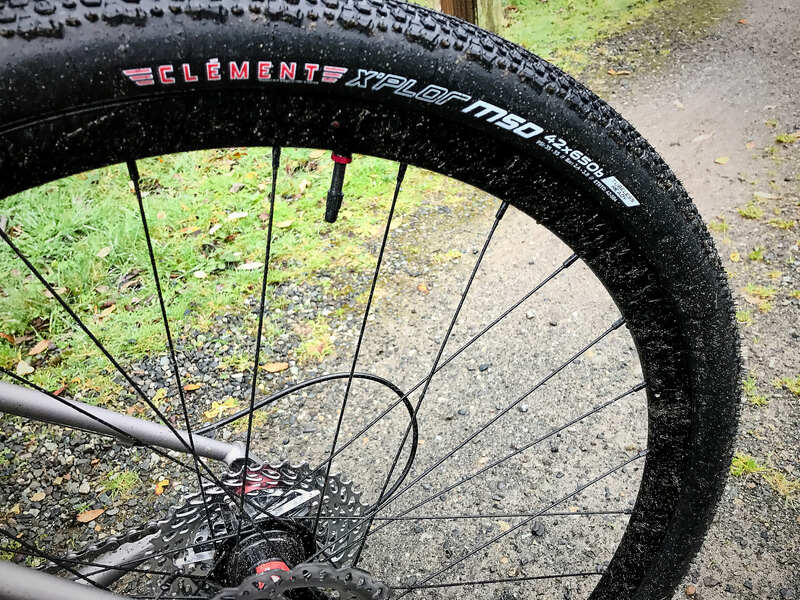 And, I expect next time I ride with Steve on gravel, it’ll have a different crank, cassette, and tires—the pair he was testing were new from Clement. What won’t change is a couple of former roadies riding road bikes on dirt at ~25 PSI. Wasn’t that long ago, we were filling tires up to a 100 PSI, right? A bike so new doesn’t even have a proper axle. Also, what’s very encouraging for the market is if a Ti bike arrives in retail stores. Any Ti owner knows why. It’s arguably the best-ever material for mixed surfaces like we rode over, burning off turkey dinner calories, and talking bike trends. You can’t buy the prototype bike Steve was riding, but if REI put in their stores as is, it would retail for about $4200.00. My brown bike as built is about $8K.